During the First World War, patterns of ‘disruptive colouration’ were applied directly to guns, trucks and tanks to disguise them from reconnaissance aircraft or spotters in enemy trenches. Given the historic strength of the Royal Navy, it followed logically that Britain would be the most innovative in developing the field of naval camouflage. For, while the human losses on the Western Front were staggering, it was the loss of merchant ships carrying troops, supplies and munitions that took the greatest economic toll. They became easy targets for torpedoes as soon as Germany announced its campaign of unrestricted submarine warfare in January 1917. Dazzle is a development curious to the modern mind, which defines camouflage as something that blends an individual in with its surroundings. These striped ships, highly visible, seem more appropriate to the realm of art than combat and occupy a unique place in military history, as one of the few instances where the widespread use of professional artists was of considerable tactical value. Norman Wilkinson, who developed the idea for dazzle camouflage and oversaw the operation, was an accomplished marine painter before the war. He submitted his camouflage idea to the Admiralty in spring of 1917 and was allowed a trial that August. Previous proposals, which attempted to paint or cover ships to blend them with the water and atmosphere, were unsuccessful due to the vagaries of weather at sea. However, the results of a trial convinced the Admiralty in October 1917 to recommend that all merchant ships receive Wilkinson’s camouflage. Dazzle designs both dismantled the outline of the ship and created an optical illusion that deceived enemy eyes in submarines regarding the speed, size and direction of the painted ships. By November 1918, over 2,300 vessels were painted with unique schemes. 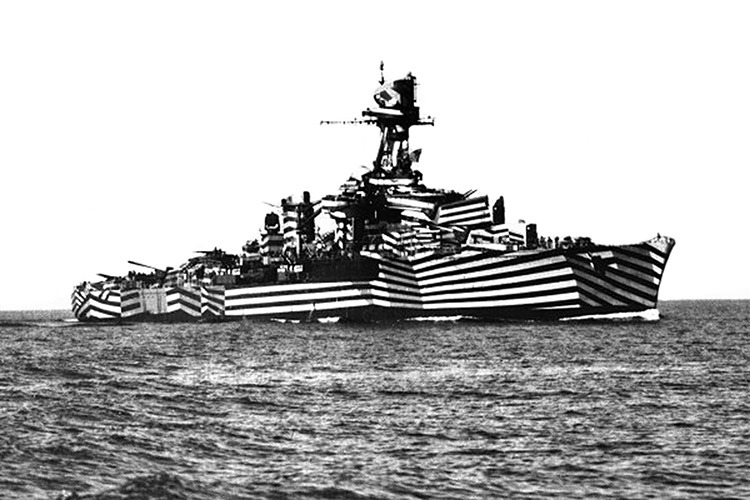 The US navy also adopted the dazzle approach in 1917, along with four other camouflage methods. All dazzle patterns were developed in a London studio by Wilkinson, five male designers and 11 female art students. They observed painted models, judging the effectiveness of deception using a periscope and turntable before sending them to the ports as templates. At the ports, men such as Vorticist artist Edward Wadsworth, who oversaw the painting of ships at Bristol and Liverpool, tailored the patterns to individual vessels. Generally, the designs consisted of angular, geometric shapes in no more than four colours. Shapes never aligned with a ship’s edge but carried through to the other side or over the railing and onto the smokestacks. Port and starboard patterns were always different, too. Adopting a characteristic of modern art, the design very intentionally did not fit its canvas (the ship) but rather seemed to take on a shape of its own. After a year, a committee met to determine the effectiveness of dazzle camouflage. Though the data was only marginally in its favour, the committee recommended the continuation of the project; it was inexpensive and efficient, since ships already needed regular painting, and contributed greatly to morale, due to both its perceived safety as well as its aesthetic appeal. Dazzle ships were, as the British architect Frederick Etchells noted, a ‘bright spot of the war’, easily adaptable for mainstream life and commemorative purposes. This camouflage scheme played a small role in the overall conflict and was only marginally successful in its intended use, but it was so visually arresting that it continues to capture the imagination. In March 1919, the Chelsea Arts Club hosted a Dazzle Ball at the Royal Albert Hall and dazzle-striped designs were quickly commodified into curtain fabric and bathing costumes. Angular, cubist-looking designs begin to appear in the British decorative and poster arts of the postwar period, too. Dazzle is a development so aesthetic that it seems out of place in wartime. In the early 20th century, the ships gave a wider group of people exposure to and appreciation for modernist art and design. Its wide use in centenary commemorations opens the eyes and minds of more people in the early 21st century to the history of this important conflict. Margaret F.M. Walker is the assistant curator at the Vanderbilt University Fine Arts Gallery in Nashville, Tennessee.